Our water front cottages rent weekly from May 1st through Thanksgiving and while the summer is our busiest, fall in arguably our most beautiful. The cottages at Jenkins Beach offer comfortable, old fashioned Maine 'camping'. Five cottages are rented out but reservations during the summer season are a must. Through the fall until almost Thanksgiving, visitors can rent one of the furnished and fully applianced cottages and be right on the beach and lake. They are heated and open from May 1st through Thanksgiving. Beach privileges and discounts on boat rentals are included. Our waterfront cottages include equipped kitchens, blankets and pillows (Bring your own linens) and all have showers. They sleep 6 to 8 people. LEAF PEEPERS REJOICE! 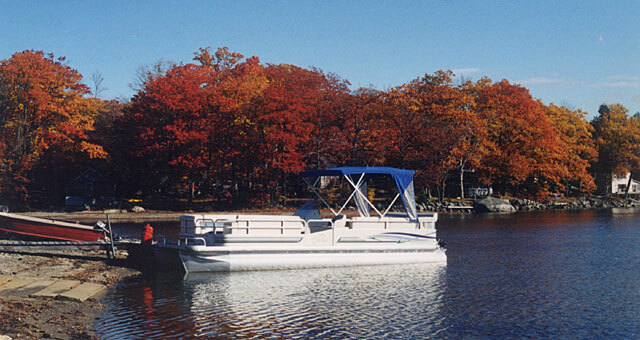 A crisp fall day and a pontoon boat... a match made in Maine. Whether your interests go toward enjoying the sights or maybe you are looking to expand your fish tales, add one of our rental boats to your stay at Jenkins Beach and keep fond memories for years to come.